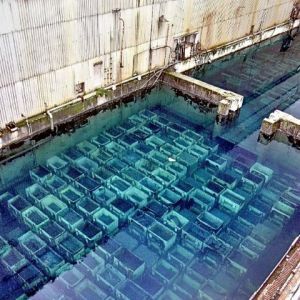 Photos of radioactive waste storage ponds in a shocking state of neglect at the UK’s Sellafield (previously Windscale) nuclear reprocessing plant reveal that they have been severely neglected for decades. Cracked concrete tanks—the largest measuring 20m by 150m with a depth of 6m—have been left open to the elements since the mid-1970s despite high levels of radioactivity. After being left derelict for nearly 40 years, the radioactive material from hundreds of tons of spent fuel rods left in the ponds is now in danger of being exposed to the air, which could set off a nuclear explosion. This poses a major threat to public safety at the plant in Cumbria, northwest England. The photos were published on the web site of the Ecologist magazine. The photos make a stark contrast to the Sellafield official website, with its claim of “Operational Excellence” and stated aim to “safely manage nuclear waste”. The nuclear industry was sold to the public as a better and less polluting energy source than gas, coal or oil-fired power stations and has never been viable from an economic point of view. The real motivation for nuclear power plants in the developed countries has always been bound up with the production of the material needed for nuclear weapons, and governments have subsidized the industry accordingly. From the mid-1950s onwards, the British government started to pursue commercial opportunities in nuclear power generation and reprocessing, attempting to capitalize on the huge amount of public funds it had diverted into the production of nuclear bombs. In 1963, the Windscale Advanced Gas Cooled Reactor (WAGR) prototype went into operation. In 1973, an explosion in one of the reprocessing plants created a radioactive cloud affecting the lungs and skin of 35 workers. In 1976, excavation work caused a huge leak of radioactivity into the ground from a waste storage tank. In 1978, a waste tank was discovered to have spilled radioactive material. In 1983 came the “Beach Discharge Incident” in which radioactive discharges caused the closure of beaches along a 10-mile stretch of coast. By the 1990s Sellafield had been turned into the main dumping ground for nuclear waste, not just from Britain but for countries around the world. Thousands of tons of spent fuel were—and still are—arriving at the plant every week from Britain, Germany, Japan and six other countries. Even more radioactive waste could be sent to Sellafield. It was revealed this week that the plant is among a number of sites being considered to house intermediate level waste from 27 soon-to-be dismantled Royal Navy submarines. The radioactive waste will be stored at either Sellafield, Chapelcross near Annan, Aldermaston and Burghfield and both Berkshire or Capenhurst in Cheshire. The contract will be in place for decades to come, with the site chosen in mid-2016 and used for interim storage of reactor components until after 2040. Even according to published data, Sellafield has been constantly pumping large quantities of low-level radioactive material into the sea—making it one of the most polluted areas in the world and likely to be second only to Chernobyl in the level of radioactivity. The justification was the policy known as “dilute and disperse”, which assumed that the radioactivity would be harmlessly distributed out to the sea. In reality, the radioactivity is collecting rather than dispersing. The plutonium and other pollutants are gradually being swept back to the shore by ocean currents, deposited on the mudflats and river estuaries of Britain’s northwest coast, and causing dangerous levels of radioactivity. In 1984, when campaigning organization Greenpeace took a bin full of mud from mud flats around the Sellafield site and dumped it in Whitehall (the London road containing overall British governmental administration), the area was cordoned off and the mud quickly removed to a disposal site as radioactive waste. The seabed off Sellafield is estimated to contain about three quarters of a ton of plutonium that has accumulated over decades. This will keep coming ashore and poisoning the environment for centuries to come. In 1997, a British Department of Health survey found plutonium in the teeth of some 3,000 teenagers in Britain and Ireland. The quantity was found to vary in inverse proportion to the distance the person lived from Sellafield. Scientific papers have concluded from national data that there has been a tenfold increase in the rate of childhood leukaemia in the area around Sellafield. One of the main ways of covering up the true cost to society of nuclear power has been downplaying the difficulty, danger and cost of nuclear reprocessing and safe storage of the unwanted byproducts. In Britain, this was made the responsibility of private companies with a strong motivation to cut corners in order to maximize profits. The results of such behind-the-scenes agreements between governments and private companies are now visible in these photographs. Far from having a coherent plan for dealing with the medium-and high-level radioactive waste, the authorities have allowed the site to become a ticking time bomb.